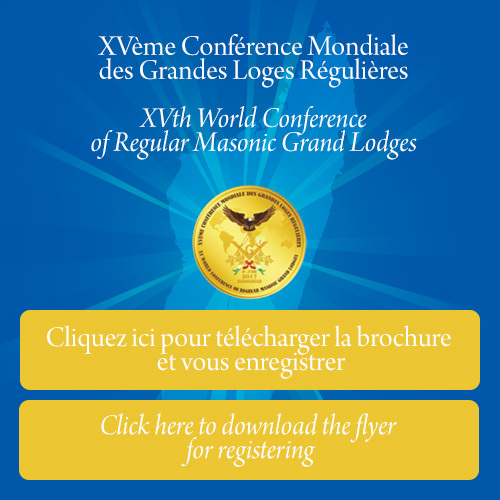 On behalf of all Brethren of the National Grand Lodge of Madagascar, it is a real pleasure for me to invite the Delegations of the Regular Grand Lodges to take part in the XVth World Conference of the Regular Grand Lodges from 24th to 27th of May 2017 in Antananarivo – Madagascar. Masonry is present on the Large Island since the end of the XIXth century and Regular Masonry came out tardily as the National Grand Lodge of Madagascar was consecrated in 1996. Since this date our Order has developed in Antananarivo the capital as well as in the provinces and our Order counts today approximately 400 Brothers divided in twelve Lodges. Several Masonic meetings are envisaged concurrent with the Conference as you will be able to see in this booklet. Our wish is to ensure that you a have a great stay in Madagascar, rich in fraternal friendliness and this, under the best conditions possible. We hope that we will be able to make you appreciate the legendary hospitality of our country, full of numerous contrasts and that you will be able to come, accompanied by your wives who will be able to thus benefit from this visit to appreciate the diversity of the cultural, artisanal and culinary, wealth of our country. If your timetable allows it to you, do not hesitate to remain a few additional days in our Large Island and leave after meeting its generous population and experience a tour of its extraordinary and preserved endemic nature, which makes it a true sanctuary. We are at your disposal to propose programs to you or to help you to establish a set of themes to suit you. It remains for me to say “tongasoa” or “welcome” to Madagascar while hoping to see a great number answering this fraternal invitation. The National Grand Lodge of Madagascar (GLNM) will be honored to welcome you in ANTANANARIVO, the city of a thousand people and of peace, from May 24th to 27th 2017, concurrent with its Grand Lodge Annual Meeting, which will be held on Saturday, May 27rd, 2017. Freemasonry, essentially, since its origin, magnifies an ideal of universal building, for the moral and spiritual development of its members. The esoteric aspect and quasi mysticism of freemasonry attracted Africans in general and the Madagascans in particular by finding there a school of reconciliation and thus of togetheness. Being builders able to take up challenges, it is quite natural that the Brethren of the GLNM resolutely turned to the consolidation of our building by working day in day out to gather what is scattered, developing, radiating and widening our relations with the Regular Grand Lodges of the World. In this spirit, in harmony with Masonic principles and the other Regular Grand Lodges of Africa, the GLNM and MADAGASCAR will receive in the name of the African Continent and within the framework of the policy of changing continents, this high gathering on this large very welcoming island; and this, for the second time in Africa in a little less than twenty years, since its creation. All this, in the distinct way of Freemasons, which is to communicate and link themselves in affection and brotherly love. For this, the topic “Masonry Values for Human Equityand Sustainable Development” is submitted for the reflection and contribution of all participating Grand Lodges. The initial approach to this topic, before anything, should be very pragmatic and operative because it is necessary for us to associate action with thought while keeping in mind our values of equity and sharing.